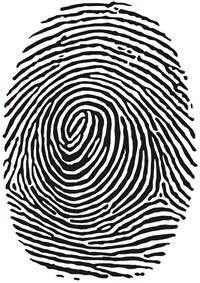 I am brand new to this and I am trying to make a lifesize fingerprint stencil. I realize that I need to make connections or the interior parts will just fall out. Can I use the Make the Cut software to resolve this or do I need to make connections within the jpeg file? This is probably too challenging for a first project but it's something I need to get done so any advice is welcome! I have a Zing Air. I grasp the idea of a stencil but it would either need to be in two parts or the outer contour split. If it is just the print as in a forensic format then you would not need an outer contour just a square/rectangle to hold the holes for the stencil. A pic of what it is you are trying to format would help. It is amazing what you can do with MTC trace. I'ts my go to program for this facility. quampegan, What material are you cutting the stencil from? If you will be cutting from some type of vinyl, then you would use transfer tape to move the stencil after it's cut and therefore you wouldn't need to alter the fingerprint by adding bridges between the shapes. Just a thought if you want it finger size just black up your own finger and print with it!